What is Fruit From The Vine? Fruit From The Vine is a pātaka kōrero – a storehouse of word and thought – that grows and cultivates all kōrero from the belief that being Māori is awesome; that it's invigorating, fun and powerful. It rejects the narrative that being Māori is a burden, a liability, an inconvenience or a statistic waiting to happen. Call a child bad for every day of their life, and how else can we expect them to turn out? A person's Māoritanga will always be celebrated here for what it is – a powerful gift, an inexhaustible source of strength, an exhilarating rush, the journey of a lifetime. 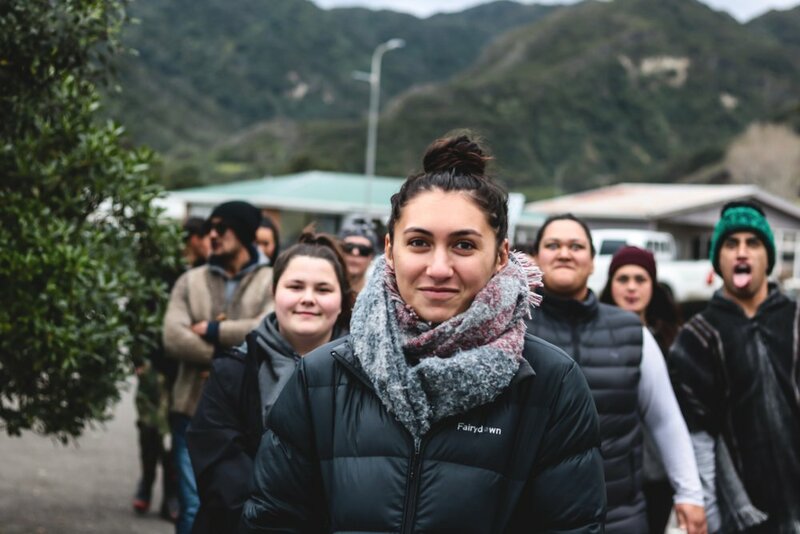 FFTV is dedicated to growing kōrero that speaks honestly and authentically to important kaupapa, empowering rangatahi to move forward from a space of strength and connection. Mana Tāne is to equip you with the kōrero and wisdom of tāne Māori. May you leave here happier. He aha te mea nui o te ao? he tāngata. What is the most important thing in the world? It is people. Originally a blog on Wordpress, after a piece I wrote called "10 things I wish my friends knew about being Māori" went viral, I realised there was a real need for kōrero that was both honest and uplifted the Māori experience. But I knew that if FFTV were to become something bigger, it needed to have epic visuals and quality kōrero to reach our generations immersed in technology. On top of that, it also needed to have meaningful cause – at that time it was just me and my mere to grind with mass media; I didn’t know what meaningful cause looked like. The expansion and development of FFTV⏤as a media company and with the Mana Wāhine and Mana Tāne series⏤came about when I was on a marae last year. My whole group and I had the opportunity to share our life stories and people went really deep; listening to so many emotionally-charged stories was an incredibly humbling experience. Every time someone shared, I was struck by the fact that many of us were here, and still here, because of the aroha, manaakitanga and tautoko of strong Māori role models in our own lives. Then the thought occurred, what if I hadn't had any of these role models in my life? Where would I have ended up? What's more, how many rangatahi are going through life every single day without strong Māori role models to look up to? That was the moment I realised I could create something bigger with FFTV – that the stories, tragedies, hopes, tears and dreams of my rōpū could be my meaningful cause to start this and change everything. E hoa if you're looking for strength, wisdom, inspiration, aroha, tautoko or affirmation that your Māoritanga is an incredible expression of the human experience, you don't need to look any further. Who is Fruit From The Vine? Tēnā tātau e te whānau! Tēnā pā mai! Get in touch 🤙🏼 My biggest thing is that hei aha te āhuatanga (whatever the form), that there is cause, reason and purpose to what drives you and by extension the things you create. FFTV is here to shake up the status quo – how does your work do that? There's enough thoughtless media to outlast our entire whakapapa combined; what intention, care and aroha has gone into your work? Who does it give mana to? Does it take away mana from anyone? Those kinds of pātai. For the Mana Wāhine and Mana Tāne series, currently I'm shoulder-tapping mates and will be doing so for all of 2018. Always keen to share kōrero with our Māori peps creating positive change where they are though, so feel free to pā mai here or via the socials. It is a kaupapa Māori and tikanga Māori space. Everything is grown by rangatahi Māori, for rangatahi Māori. It is a relationship-oriented, people-focused, quality driven, high-trust space. We are disruptors; we are change waiting to happen.